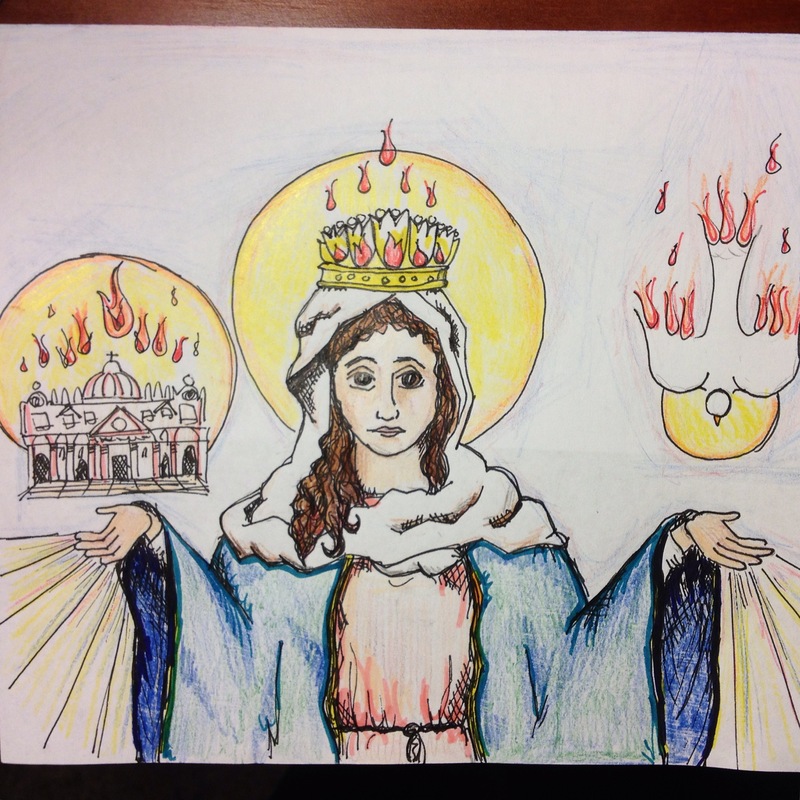 Who is Mary as Mediatrix? So I know it’s not May anymore, but I’d like to share a post that was planned for May, but providentially is being published today. What does a name for Mary have to do with the incredible suffering happening now in Orlando? The following is my humble reflection in answer to that question. I had been looking into the title of Mary as Mediatrix this May. At the Schoenstatt Shrine this May, they celebrated a Marian mass every Saturday for the month of Mary. Each mass was celebrated under a different title of the Blessed Virgin. One Saturday, they celebrated Mary as “Mother and Mediatrix of Grace.” Hmm, I thought, that’s not a very common title, what’s that about? I’ll offer a few brief points on the theology behind the title to invite any readers who are a bit skeptic to think it through. And then I’d like to bring it back to the personal and to the now. I think this title of “Mediator” can be a tough one to swallow, especially if seen within the context of our current culture, separatistic and divisive as it is to so many natural bonds. Why is Mary called mediator? Isn’t Christ the only mediator between God and man? I mean, that’s straight out of scripture, “For there is one God, and one mediator also between God and men, the man Christ Jesus,” (1 Tim 2:5). Sounds pretty straight forward and clear to me. And it is! For no creature could ever be counted as equal with the Incarnate Word and Redeemer. Just as the priesthood of Christ is shared in various ways both by the ministers and by the faithful, and as the one goodness of God is really communicated in different ways to His creatures, so also the unique mediation of the Redeemer does not exclude but rather gives rise to a manifold cooperation which is but a sharing in this one source. What does that communicate to you? I think for some it might be helpful to hear so clearly that Mary’s place is always subordinate to Christ, to God. People more enlightened than myself have simply explained that since Mary’s heart was entirely filled by Christ, we never have to worry about paying “too much” attention to Mary, or loving her “too much” because her only desire is to take us straight to Christ – and because truly, who of us could ever love her more than her own divine Son? But wait – if Christ is the one Mediator between God and man, why not just go “straight to Christ?” Perhaps read that sentence again…with that same logic, couldn’t I say let’s go “straight to God the Father” and skip Christ? Clearly the Father sent Christ to bring broken humanity back to Himself. So this role of a “mediator,” this notion of a go-between if you will, originates from the Father’s plans within the Trinity and with mankind. And the mediation that Mary exercises is not her own, but rather a participation in the overflowing of Christ’s mediation between God the Father and man. I hope those brief sketches were helpful to start addressing those common questions of “why Mary?” in the first place, or perhaps at least enough to invite further thought. I’d like to bring it back to the personal and to the now. Who is Mary as Mediator for me? I think the most direct way I can put it is this – Mary’s not someone I actively grew up really seeking or talking to (here’s an earlier post on this). She was pretty far in the background really, until college. In college, I hit the first real spiritual dryness I’d ever experienced, and also the first real challenge with inner anxiety and suffering. There, from that place of confusion and feeling lost, you might say that Christ drove me into His Mother’s arms. From the moment I opened my heart to her, there was a before and after. This personal experience taught me deeply that Mary is there as a bridge between God and man precisely because that’s where God wants her, that’s where her place is in His plan of love for all the world, and because she is continuously singing her Fiat, her yes, to that plan of love. And because God knows that’s where we need her to be, too. And though all of that makes sense to my reason, the parts I do understand, which are close and tangible, seem to lead to a deeper, unfathomable mystery of the Blessed Mother and her relationship to God and us. But simply put, I was making scant progress through my own desert before opening my heart to Mary, and afterwards, in my relation to the Trinity and the whole of my life, I experienced growth, depth and transformation in a way I had never known before. Father, we humbly ask you: May the light of faith glow within us, that we might see our Mother clearly and place our trust in her as Mediatrix. Grant that, like her and as is pleasing to you, we are always joyfully ready to offer ourselves in selfless service as instruments for the salvation of the world. Not only does Mary intercede between God and man, she teaches and forms us to take up that same mediating role on earth. Just as mentioned above, that the priesthood of Christ is shared by ministers and the faithful, “so also the unique mediation of the Redeemer does not exclude but rather gives rise to a manifold cooperation which is but a sharing in this one source”. You and I are called to be mediators of God’s grace. And is not the hateful event yesterday in Orlando a deep sign of how much our world needs grace? The natural reaction to hatred and violence is instinctively most often more hatred and violence. We’re wired to fight back, to protect life. And in general, there’s nothing unnatural with that life instinct. But I have a hunch that you can see that clearly the path where such instinctive, reactive retaliation leads…and I’m probably not I’m alone in longing for a different outcome for our nation. Yet, how can we attain the hope and self-discipline to reach for peace, grace and mercy in the midst of such reactive hatred? And who am I to reach for that? I think here Mary also shows the way: from our lowliness. Mary proclaims forever the greatness of the Lord and the smallness of human instruments. We none of us can become the river of mercy that our nation needs in such times of hatred and violence. But each of us, in humbling ourselves and being open to God’s working in the world, can become real, effective channels of grace for others. How open am I to receiving mercy in my own heart from God? Surely rooting out the hatred and violence in our own hearts must be the first step, which I think indicates a two-way process of choosing to be transparent before God and then God working in our hearts. How open am I open to transmitting God’s grace to others? Sometimes (always?) it’s easier to distance, ignore, or become reactive than to hold on to ourselves and allow God to love others through us. And do I allow myself to see the glow of the divine on my brethren’s brow as well? We can also each be open to receiving grace from our brothers and sisters in humility. Perhaps these can be helpful questions to reflect on with our Blessed Mother, Mediatrix of Grace. With each new suffering that happens, I hear an urgent steady call for our nation to be transformed. And who knows the hate that could be overcome, who knows the violence that could be pacified, if we each rose up with our “yes” to God the Father’s cry, and to our Blessed Mother’s plea to mediate His grace to the world?